Ivory Coast midfielder Yaya Toure is in contention to win the Confederation of African Football player of the year award for a fifth consecutive year. Toure is one of 10 men on the 2015 shortlist revealed by Caf on Monday. The 32-year-old Manchester City player first won the title in 2011 and another would give him a record fifth award, one more than Samuel Eto'o. Also on the list are England-based pair Ghana forward Andre Ayew and Senegal midfielder Sadio Mane. The winner will be decided by votes of the coaches or technical directors of the national associations affiliated to Caf. An awards gala will be held on Thursday, 7 January 2016 in Abuja, Nigeria. 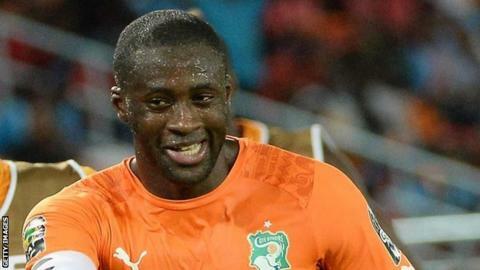 Toure led Ivory Coast to Africa Cup of Nations glory at the start of the year, helping his country put behind them years of narrowly failing to win their second title. Ayew moved to English Premier League club Swansea in June and has been a star performer, scoring five league goals in 11 performances. Fellow nominee Borussia Dortmund's Gabonese striker Pierre-Emerick Aubameyang has been outstanding for his German club, hitting 17 goals in 14 games this season. Also on the list is current BBC African Footballer of the Year Yacine Brahimi. The Algeria international plays his club football in Portugal for Porto.